Sadly, I didn’t see the lunar eclipse last week. It was a rare combination of supermoon, blood moon, and lunar eclipse that hasn’ t happened for 152 years! I know some people who were pretty excited by the event. The Great Sand Dunes National Park in southern Colorado would have been a gorgeous setting to welcome in those new energies. Thankfully, we can live vicariously through the beauty graciously shared by Patrick Myers and the National Park Service. 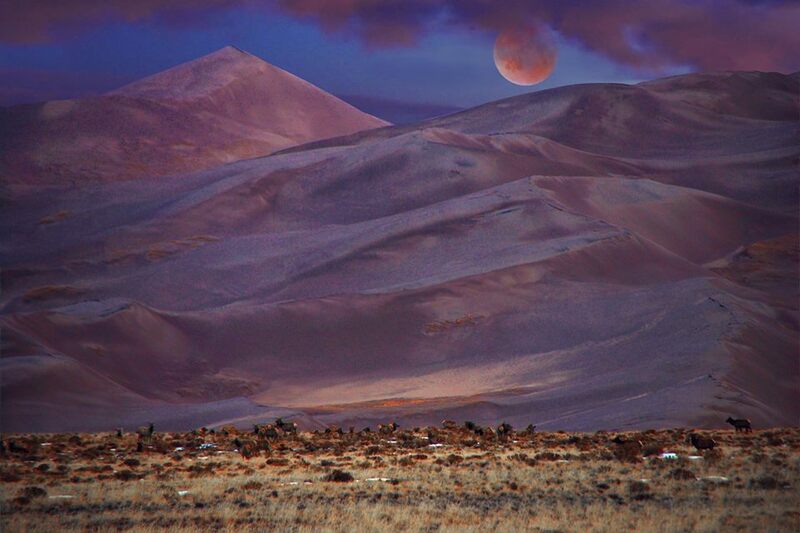 The soft moonlight on the dunes looks like a painting and inspired my poem. Thank you. Sadly, I missed it too! Sorry. I’m grateful for all the photos and videos online! An amazing picture and you’ve captured those wonderful ‘painted’ dunes with your words Brad. They definitely inspired me and I’m glad you enjoyed them too. I hope your week is full of beauty Andrea. Thank you Mitza. May beauty fill your heart. I’m all for virtual travel, Brad. I leave the real kind to people who enjoy it. Gorgeous pic and lovely words. Hugs. Thanks Teagan. You and your imagination definitely travel well. I’m missing the joy of traveling to new places in person. Absolutely gorgeous and your words so beautiful! Thanks Pragalbha. I’m glad you enjoyed them. May we find beauty where we are. You are welcome. There is beauty indeed, where we are. Sadly, I missed it too, but the photo is stunning and your words beautiful indeed. !!! What an incredible shot! What a mood! I think this is one of the best photos I’ve seen. I actually saw it, and it was stunning. Agreed Cecilia. It’s a gorgeous image! Beautiful post!! I was fortunate enough to see it! Incredible and surreal are the words I would use to describe it!! Thanks Kirt. I’m glad you got to see it live. What a beautiful image that is, and the eclipse no we did not see here .. But I did get to see a wonderful Full bright Super Moon as that night was clear for once overhead💙..
Good gracious! That is absolutely beautiful, I am humbled by its awesome beauty. Wow! The upper part of the shot (I mean, the dunes and the sky) really look like a painting. Beautiful colors!